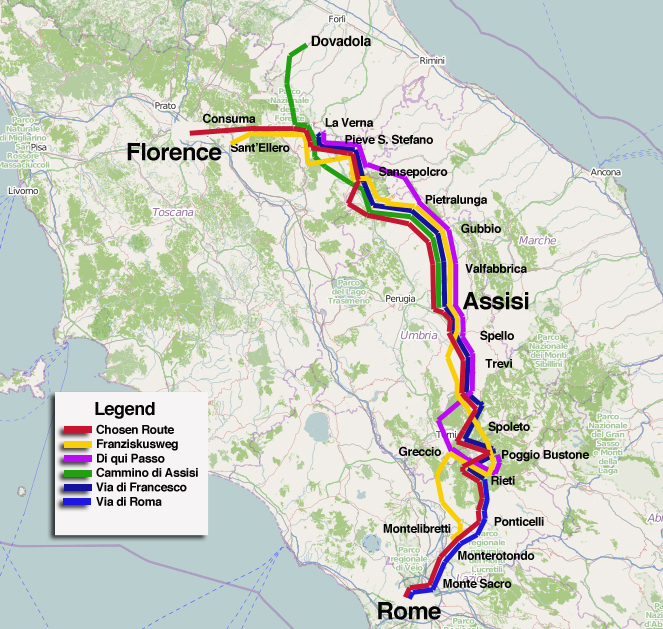 The many modern routes of St. Frances in and around Umbria in Italy. I’m back to the writing routine for The Way of St. Frances: From Florence to Assisi to Rome and wanted to share some of the helpful info I’ve learned that might not make it into the book. One example is the graphic above of the many walks of St. Frances in and around Assisi. As I’ve said before, my completed book will be the first one that actually guides pilgrims on every step between Florence, Assisi and Rome. The almost-complete guidebooks are Franziskusweg, a German book (in yellow above), along with the German language Outdoor Guide by the Dutchman Kees Roodenburg (not shown). Both of these guidebooks have pilgrims taking a train for the first day out of Florence and then taking public transport the last day or two into Rome. This is too bad, since there are good walking routes at both ends. Another popular English (plus Italian and German) guidebook is by Angela Seracchioli (in purple above). Her thick and well-researched book covers the distances between La Verna and Poggio Bustone. The Via di Francesco (dark blue) of the Umbrian Tourism Department also starts at La Verna then continues on to Rieti, where the Via di Roma (light blue) picks up for the last 100 or so kilometers. The Cammino di Assisi (in green) is a popular route among Italians that begins with non-Frances sites at Dovadola and then finishes at Assisi. There are several smaller routes as well, like the Holy Valley routes near Rieti and the Sentiero Francescano della Pace between Assisi and Gubbio. The challenge I faced was to find a single route that actually has pilgrims walking on foot each step of the way between Florence, Assisi and Rome. This required some scouting and help from locals who know these routes well. The resulting route is marked above in red and, modeled after the Camino de Santiago in Spain, is doable in 30 days. Sandy, that’s a great summary of the various routes. Thanks. We’re very much looking forward to more information on your route, especially since it will allow us to walk the whole way. Arriving in Rome by foot as a pilgrim must be a wonderful experience. Juli and I plan on doing this next year and can’t wait. Planning on fall. Mid sept to mid oct. Are there better Times to do it? That sounds like a wonderful time. My book should be ready for you by then! Sandy, what is the difference between the two routes from Assisi to Spello? Does the harder one climb Monte Subasio? The harder one climbs partway up Mount Subasio and then follows just below the tree line to Spello. The downside in the climb, but the upside is you get to stop at Eremo delle Carceri, one of St. Francis’ favorite spots. Another upside is the amazing view of the valley — you can see from Perugia almost all the way to Spoleto. Thanks. We’ll have to see your GPS track to make a final decision, but I am sure we will either take the harder route or do a day out and back walk from Assisi to Eremo delle Carceri, which we haven’t seen yet, and then begin walking to Rome the next day. Sandy, very excited for your book. I am planning on walking from Assisi to Rome in Mid-Sept. I just read that hunting starts in Italy in Sept. and that Sundays are the hunting day. Would you know about this and if you would also recommend NOT hiking the trails on Sunday? That’s a fabulous question and the first time I’ve heard it. Let me ask some local friends and see what they say. Thanks for the good inquiry! We walked from Dovadola to Assisi this fall and the hunters were out. They seemed to know what they were doing, and handled their weapons very responsibly. I worry about walking near hunters at home (Virginia) but did not feel threatened in Tuscany or Umbria. Might not be a bad idea to wear bright colored clothing or a best. Thank you for this work. i have been looking for good guidance for the walk from Florence to Rome. Knowing it is not the best time of year but it is the time I have, I am hoping to do this in March or April 2015. I believe the book will not be out by then hope you could provide some of your insights earlier – would that be possible? Of course, I’m happy to help. Feel free to contact me here and I’ll get back asap. Congrats on your upcoming walk! Thank you for replying and mostly for offering to help. I have contacted some of the businesses that “help” with these walks but they all want to do more than I want (not sure yet if it is more than I need). I don’t need my luggage moved or all the bookings made – I mainly want good directions and to stay off busy roads as much as possible. It seems that your guidance may be important here. I expect to do this mostly on my own though friends and family, now that they know of my plans, seem interested to join for bits of it. We have had a tragedy and I am looking to put the world back together in a new way. This seemed one of the ways to start that journey. I am still very interested in your help for my walk this spring. A question I have is about how the refugios (or similar) work, particularly early in the walk, using your path as it is not exactly along the lines of the Cammino di Assisi. Hoping you can be back in touch with some advice. I am interested in the same details Donna has asked you about. I’m planning to follow your path in September. How is the book going? I hope you are not feeling tremendous pressure. Good luck! My book will be out in September. I’ll send you an email and we’ll see how I might be able to help in the meantime. What about the ISBN of your book, please? Thank you. Hi Jay ~ I’ll let you know as soon as an ISBN is assigned. Thanks! Jay, I hope work on the book is going well. We’ve firmed up our plans and plan to walk from Assisi to Rome starting in late August. If you are not too busy, could you perhaps send me an email as well? I could use any help you can provide to help me plan. Sorry, I meant Sandy, not Jay! Hi, would you recommend one week of Camino Francescano with a 14 month old (being planned for second part of September)? The two of us walked the Camino del Norte before, so we know the “usual” part, but I think we’d need some advance room booking and maybe some other items or our car to be around within reach. Also which route of this Camino may be a better choice for us? Thanks a lot for experience based advice. I think you’d want to be around cities and not too much out in the countryside. Perhaps Gubbio to Assisi to Spoleto? Each of those along the “Via Francigena di San Francesco” has several accommodation options as well as access to nearby highways. You can find the route and other info at http://www.viadifrancesco.it. Have a great cammino! My wife (72) and I (73) are avid walkers. In the past 9 years we have logged over 4,200 kms on the various European “caminos” to Santiago, averaging 466kms per walk, 754kms being the longest. Next year we woukod like to walk in Italy for the first time and are eagerly awaiting your book to decide how much (if not all) of the Firenze to Roma “camino” we will want to cover. Only only question for now: is mid-May to mid-June a period you would recommend? Our oter option would be July. Definitely. Mid-May to mid-June would be perfect. Experienced camino walkers like you two will enjoy the differences between Spain and Italy. Let me know how I can help. The book is on schedule for a mid-Sept release. Cheers! Hiya sandy, I’m planing to do a cycle from Florence to Rome next year. (I’d prefer to walk it but think it would take too long) I’m planing to raise money for a local charity in fife Scotland. I was wondering if you could suggest any thing to help? I’d be interested in your book to. Sounds like a great project. Much of the walking route would be extremely difficult by bike, even mountain bike. It’s extremely mountainous and often very steep, with the occasional footpath in a couple of stretches that requires great caution on foot. I would probably start by trying to piece it together via maps and/or online GPX tracks. I do not know if I am doing this right! Or if I should direct my message to Sandy. I just received Sandy’s book (“The Way of St Francis”); sincere congratulations – and thanks – to the author. I have a couple of questions. (1) Re Lodging. Are the prices indicated generally for a double room, whether occupied by one or two persons, or per person? (2) Re Backpacks. My wife and I have walked close to 4,500 kms on the various European ways in the direction of Santiago de Compostela. We always carry pour own backpacks, except in very rare cases. Are there transportation services for bacpacks between some of the stages on the Way of St Francis? Can you walk up the steps of a 10-story building and back down with no problem? Can you walk 10-12 miles every day for a week without any problem? Congrats on your upcoming walk. If I were you, I would bring along a sleeping bag that time of year. It can be chilly at La Verna, for instance, and while they offer sheets and wool blankets, it’s a little cozier to have a comfy, light sleeping bag in my opinion. I have a 2 lb REI bag that has served me well on many caminos, and I think that’s what I’d take along if hostels were my primary accommodation. I think I mention in the book that there is at least one hostel (Zoccolanti, near Citerna) that does not offer linens. Buon cammino! Hello, I am looking forward to reading you guidebook and at some stage walking it. I am thinking about walking from Rome to Assisi though and wondered if the signs are marked both ways? I have ordered your book which should arrive next week. We are planning to walk from Florence to Assisi. Can you tell me how many days this might take as we need to book airfares from Australia this week as there are super specials on at the moment. If we have enough days we might carry on to Spoleto. How many extra days is this section? We are considering late Aug to mid Sept. Do you think it would be very hot at this time and will we run into problems with Italian school holidays? Would we be best trying to leave it until later in September – for the crowds and weather. Also the first stage seem a bit grueling. We have walked The the routes from St Jean and Lisbon to Santiago, also Moissac to St Jean, Milan to Rome and the coast to coast in England. Do you think we will manage this one? We are interested in catching public transport to Orvieto and then walking the day to Civita di Bagnoegio. Do you know anything about this section of walking by any chance. Hi Jane ~ Florence to Assisi will be hot and lovely late Aug to mid-Sept. Late Aug is “ferragosto,” which is basically a national holiday when everyone goes on holiday, but fortunately some of the locations you’ll be at are holiday places. You may want to make reservations early for places like Badia Prataglia and Gubbio to ensure you get a hotel. High temps will be in the 35-37 degree range. Not for the faint of heart. As far as difficulty, Florence to Assisi is definitely more difficult than SJPP to Santiago, and more difficult than Milan to Rome. I’m not as familiar with the other routes you mention. I created a comparison chart that shows elevation profiles for Florence to Gubbio, Assisi to Rome and SJPP to Burgos. Take a look and compare at the pdf at this link. As you can see there are many more steep hills, but nothing is as steep or high as Route Napoleon between SJPP and Roncesvalles. Number of days: this is a minimum of 14 days. Even if you’ve been to Florence already it’s certainly worth another day there. I’d recommend a rest day at La Verna, especially if St Francis is dear to you, and a day to explore Gubbio and Assisi. So that’s actually 17 days. Assisi to Spoleto is three days. I don’t know the Civita di Bagnoegio route. If you have any info you can send I’d be interested in seeing it. I love Orvieto! I am looking for a 5 to 7 day walk to do in January and am very interested in the St Francis Way and using your book as a guide. Is there a particular section or sections of the route you would recommend as a 5 to 7 day walk for this time of year? Either as a single walk or catching public transport between a few sections. We would love to combine remote natural beauty with historical sites. I would love to know your thoughts on selected highlights! Hi Luke — I’m glad you’re interested in walking part of the Way of St Francis. Due to weather and short daylight hours I don’t really recommend walking in the winter. However, the lower elevation, more populated stretches like Assisi to Spoleto would be doable. Or perhaps Rieti to Rome. Be very careful of snow at high elevations though. Buon cammino! Thank you so much for all the research you’ve done. I just purchased your book and I am trying to plan a walk in the fall this year. I have about two weeks, and would like your recommendation on the best part of the Way of St. Francis. (Your favorite) I like it all. Nature and old cities. I can always get somewhere by train or bus, but would like to walk the two weeks straight. Awesome! The core of the walk is Santuario della Verna to Rieti. If you started at la Verna and then ended at Spoleto that’d be about 15 days +/-. You could also start at, say, Gubbio and then head beyond Spoleto to lovely Piediluco, Poggio Bustone and finally Rieti. So many good options. Buon cammino! Congratulations on your walk! Yes, reservations are important. Not as easy to wash clothes, but still possible. You will see some pilgrims. This way is becoming more popular but still is much quieter than the Camino de Santiago. Buon cammino! Hi Sandy, I plan to walk from Luca to Siena in May 2019, Hope to experience a beautifull Spring scenery, am I right. What do you think of my choice of route? Sounds very lovely. I think you’ll enjoy it a lot!